Looking at 129 First Ave. W. from across the street this morning. 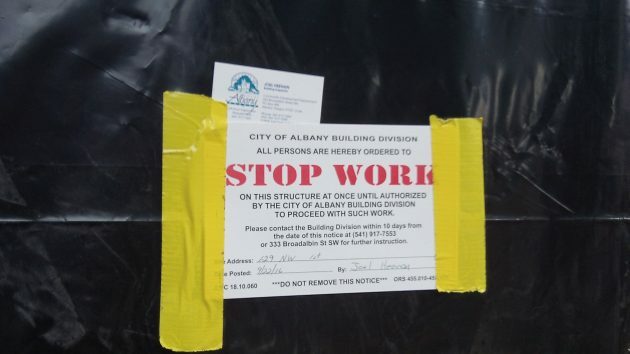 This restaurant in downtown Albany is likely to stay closed until problems with its building are sorted out. 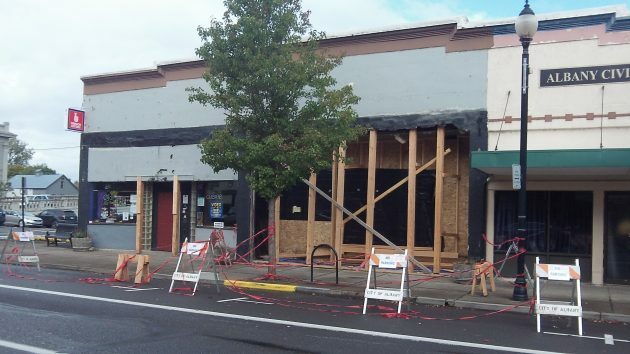 The city building department has told the owner he has the choice of repairing the structure or tearing it down. I hadn’t been aware there was a problem until my friend Jeff McMahon, the host of KGAL’s “Valley Talk,” asked me about it on the program Tuesday morning. He’s active in the Albany Civic Theater next door to the restaurant, the Espolon at 129 First Ave. W.
Back in Albany, I took a look at the closed business, snapped some photos of the open and shored-up facade, noticed the Sept. 22 “stop-work” order taped to the front, tried the number listed on the restaurant’s Facebook page, without luck, and finally checked with Albany Building Official Gary Stutzman for a rundown on what was going on. County tax records say that 129 First Ave. W. was constructed in 1920. The owner is listed as Gary C. Nieland, of Las Vegas, Nev. The county puts the property’s value at about $200,000, and the taxes last year were $4,003. The notice taped to the front of the closed restaurant. Oh. I haven’t driven by for some time so this post is a surprise. Bad days for Gary C. Nieland, I suspect. Events such as these make you respect and want to visit bar & “restaurant” establishments that are truly owned and operated. All in. That place where the Espolon is goes through a new business every couple years, so at least they’re not screwing over people who’ve been there for decades. Truth be known many properties renovated by CARA were never upgraded to meet earthquake standards. Would be nice of you to produce said “facts” to back up such a statement. tRump voter?